I try to avoid making deep fried goodies often. But we couldn't resist these aloo/potato bondas on a chilly rainy day. We had these beauties along with a cup of tea on a rainy evening watching our favorite TV show! These can be made in a jiffy if you have some boiled potatoes ready. Just mix the batter, dip the potaot mixture and deep fry them! Heavenly bliss! This could be served by itself or accompanied with any chutney of choice or just mighty tomato ketchup! First prepare the potato mixture. In a saucepan, heat one spoon of oil and add the mustard seeds. Once it starts spluttering, add the onion and green chillies and saute till the onions turn translucent. Add the turmeric powder and asafoetida and switch off the heat. Add the boiled and mashed potatoes and mix well. Also add in the coriander leaves and salt. Allow it to cool. Meanwhile prepare the batter. Mix in all the ingredients listed under the batter section ( gram flour, rice flour, chilli powder, cooking soda, turmeric powder and salt. Add water little by little and make it into a thick batter. it should not be very runny. It should be like idli batter consistency. Make small lemon sized balls using the potato mixture. Now heat oil for deep frying in a heavy bottomed vessel. Once the oil turns hot, slowly dip each potato ball in the batter and deep fry in batches of 4 to 5 for about 2 to 3 minutes until they turn golden brown on all sides. Using a slotted spoon, remove the bondas from the oil and drain on paper towels. This is one quick and easy salads I threw in for my solo-lunch when i had no mood to cook an elaborate meal for myself. This salad has some fresh summer ingredients and the addition of nuts and raisins adds some protein to it and makes it a wholesome meal. I actually used some trail mix in this salad!! Yes that is weird but I tell you try it next time you make a salad. it is just amazing. The nuts and dry fruits give a nice chewy/nutty texture to the salad and makes it sweet and salty! Have you ver been to Souplantation/Sweet Tomatoes? Do try it if you have one near your place. I have never been a salad person earlier until I visited Souplatiation! They have an array of soups, salads, flatbread and dessert in a buffet style and very affordable!! Real food and healthy indeed!! Coming on to my salad, I will have to tell you this salad is truly inspired from the salads in Souplantation. I threw in various ingredients I had in my pantry and refrigerator to make it a fun and colorful meal! Just toss all the ingredients with the drssing. Chill and Serve! 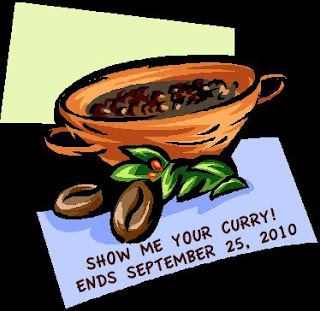 When I asked for suggestions for my "Show me your.... " event, many readers suggested the title - "Show Me Your Curry"! So this month month is all about gravies, curries, dhals and stews. I am sure every Indian household makes atleast one curry based dish a day. it is so versatile and serves as an accompaniment with dosas, idlies, rotis, chapatis, parathas and rice and can be had for all meals of the day! Hence put on your thinking hats and do send in your curry entries!! Since I will be on vacation and will not be able to post the roundup in a month, the last day for this event would be September 25th. Post any curry/gravy/dal/stew based entry in your blog between August 4-September 25th in your blog. Please limit the number of entries to 5. Please repost your archived entries during the event dates. Non-vegetarian entries are also accepted. Since i will be on a break, I might not be replying to your emails promptly. i will be getting back as soon as possible. I will be scheduling some recipes during my break! Happy Cooking and Blogging till then !